The Child Life Center is a leader in the field of early childhood and/or special education, and we offer a comprehensive, developmentally appropriate programming in a warm, home-like setting for children at ages 6 weeks to 5 years. 78% of Child Life Center parents/families increased their use of literacy materials, improving kindergarten readiness for those we serve. Hours of operation are 6:30 a.m. — 5:30 p.m., Monday-Friday. Services are provided for children the age of 6-weeks to 5 years old. In the Child Life Center (CLC), children’s needs, which range from physical, medical, behavioral/emotional to cognitive, are met in an inclusive learning environment. The CLC implements the Creative Play Curriculum for all age groups. In addition, the preschool age groups use the literacy-based Read, Play, and Learn curriculum model. Both curricula are able to be adapted to children’s individual developmental needs. The CLC implements best practices of early childhood services through its accreditation with the National Association for the Education of Young Children (NAEYC) and offers a complete curriculum that enhances the early childhood education experience of children served. 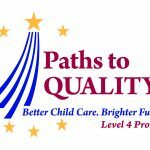 The CLC is also state-licensed and has achieved the highest level of recognition, a Level 4, through Paths to Quality, a voluntary quality rating system administered by Indiana’s Family and Social Services Administration. The Arc of Evansville’s Child Life Center has a long-standing partnership with the Evansville Vanderburgh School Corporation (EVSC), serving as a site for early intervention/therapeutic services for children three to six years of age who are identified as having a developmental delay and/or disability. To enroll or schedule a tour, please call the center at (812) 428-5433 or email Casey Dudas at casey.dudas@arcofevansville.org.